Heartburn: The Food Allergy Connection? When most people think of heartburn, they think about acid reflux and gastroesophageal reflux disease (GERD). The typical explanation for heartburn is that acid escaping the stomach and traveling up into the esophagus causes the pain, and the typical treatment is to somehow reduce stomach acid levels, either by over-the-counter antacids or by stronger drugs like proton pump inhibitors (PPIs). Paleo approaches to acid reflux have been pretty critical of lowering stomach acid as a therapy, mostly because the human stomach is supposed to be acidic. Stomach acid is important for proper digestion; it’s supposed to be there, and if it stays in the stomach, it doesn’t cause heartburn at all. 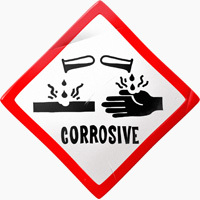 The problem is not the existence of acid; it’s acid getting up into the esophagus, where it’s not supposed to be. There are a lot of factors that affect acid reflux, including physical pressure from obesity or pregnancy, tobacco smoking, meal timing, and posture. 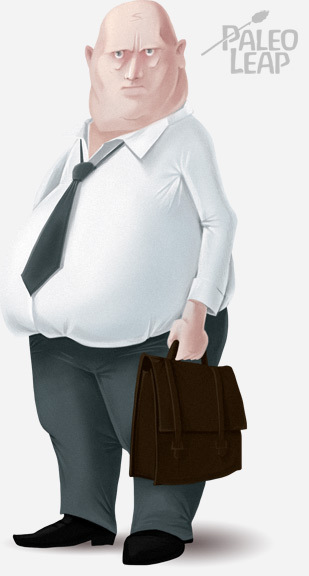 Various different lifestyle interventions like weight loss can help. Chris Kresser has also written a lot about a theory that GERD is actually caused by low stomach acid and weak digestion that puts pressure on the esophageal sphincter; you can read about it here. But heartburn as a symptom doesn’t necessarily prove that acid reflux or GERD is the problem. Esophagitis, or inflammation of the esophagus, doesn’t only come from acid reflux – it can also be an inflammatory immune reaction related to an allergic response. EE is typically more common in men than in women, and it tends to affect younger people. Difficulty swallowing is more common in EE (63% of patients) than in GERD (28% of patients); heartburn is more common in GERD (53% of patients) than in EE (20% of patients). Asthma is more common EE than in GERD. Patients with EE have various physical abnormalities of the esophagus that aren’t present in patients with GERD. The difference is important, because EE is an allergic disease and many patients with EE don’t respond to proton pump inhibitors or other acid-suppressing therapies. The study noted that almost all the EE patients were on PPIs, but only 15% of them responded to the therapy. If the cause of your esophageal pain isn’t actually acid, then lowering stomach acid levels probably won’t represent much of a solution. EE is often associated with food allergies and hypersensitivity, and food allergen elimination diets often help relieve symptoms where PPIs failed. If acid reduction therapy doesn’t help, but allergen elimination does help, the implication is that the esophageal inflammation and heartburn pain isn’t being caused by stomach acid backwashing into the esophagus. But even more interestingly, some research suggests that GERD may also have something to do with food allergens. In this study, researchers tested the esophageal cells of patients with EE and patients with GERD, and found that a subset of GERD patients actually did have cells in their esophagus that indicated some kind of allergic reaction. 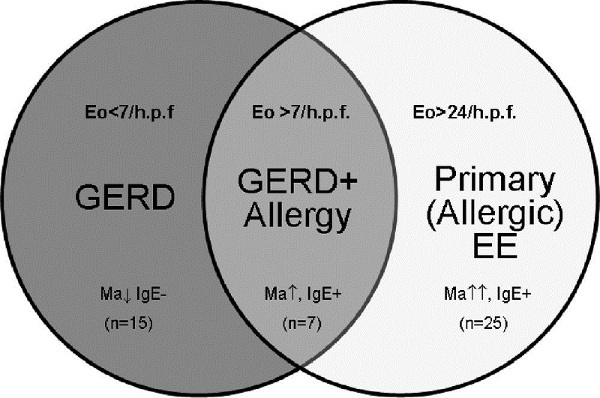 The middle group, abbreviated GERD+A, had GERD, but with some features that would also suggest an allergic component that looked more like EE. A few other pieces of evidence: children with treatment-resistant GERD have high rates of milk allergies, and this study showed that exclusion diets based on food allergy testing may be effective for some patients with GERD, especially the ones who didn’t respond to treatment by reducing stomach acid. Remember that allergies are basically the result of an immune system gone a little haywire: an allergic reaction is when the immune system identifies something objectively harmless as a threat, and reacts accordingly. Allergy issues are immune issues, which makes the GERD-allergy link interesting in light of some recent research suggesting that symptoms of acid reflux aren’t actually caused by acid burns to the lining of the esophagus, but rather by an inflammatory immune response in the esophagus (remember that an allergic reaction is also a kind of immune response). Granted, this was a study in rats and not in people, but it’s still interesting as evidence that there’s some kind of inflammatory immune response related to heartburn symptoms. Another line of evidence that suggests these researchers are onto something is the connection between Celiac Disease and esophageal symptoms. Patients with Celiac often have gastroesophageal symptoms (heartburn and regurgitation) that don’t respond to treatment with PPIs, but do respond to a gluten-free diet. This would make sense if the esophageal symptoms have an immune component: removing the autoimmune trigger (gluten) in this case relieves the symptoms. To briefly sum up: esophagitis symptoms – heartburn, inflammation, painful swallowing – aren’t necessarily caused by GERD in the first place, and even if they are caused by GERD, the actual damage might not be a result of acid burns to the esophagus. Symptoms of esophagitis might have an allergic, immune, and/or an autoimmune component even in people who also have acid reflux into the esophagus. Linking to immune system issues doesn’t necessarily contradict associations between heartburn and obesity, since the same lousy modern diet could be causing the gut/immune issues AND obesity. This should be very interesting to you if you’re eating Paleo and doing everything right when it comes to strengthening your digestion, but you’re still having symptoms of heartburn. Allergic and autoimmune reactions are completely separate from the strength or weakness of your stomach acid, so even if low stomach acid really does have something to do with GERD (which is still hypothetical anyway), addressing it wouldn’t fix a problem caused by allergies. Just to be clear: allergies and autoimmunity are obviously not the same thing (in an allergy, your immune system attacks a harmless outside thing like pollen; in an autoimmune reaction, it attacks your own body), but they’re related problems, and they’re both tied to immune-disrupting problems like hyper-cleanliness, gut flora disruption, and “leaky gut”. So from a Paleo perspective, the relationship of both allergies and autoimmunity to heartburn and esophageal inflammation implies that maybe we should start looking less at stomach acid and more at potential immune-related issues, and the diet and lifestyle factors that play into them. That doesn’t imply that food will fix the problem, and it doesn’t mean that medications or other modern treatments are useless: if you have gastroesophageal symptoms, go see a doctor. But it’s interesting to think about and it might be one contributory factor to heartburn symptom relief for people who go Paleo. Maybe it’s not (or not only) about digestive health and stomach acid; maybe it’s also about some combination of eliminating food allergens (wheat, soy, dairy…) and better immune regulation via improved gut health. And maybe people who go Paleo but still don’t get relief could benefit from looking into food allergy testing: it’s possible to be allergic to all kinds of Paleo foods, and if your symptoms are caused by a food allergy, then that’s the problem to address, not stomach acid levels or digestive enzymes.